Try to defend your land as better as you can, otherwise you will be dead! Just control your champions and help them to kill all the enemies, who are trying to kill them. Just have faith in yourself and enjoy the game right now. Are you ready? Go ahead! 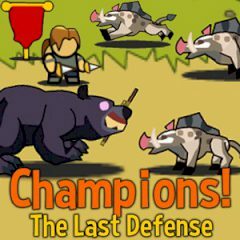 You are the only one, who can help your champions defeat the endless horde of enemies attacking the land! Do not forget to equip your champions with armor and weapon loot drops. And fight bosses and other minions with unique attacks. You will earn gold for defeating bosses that will help you permanently upgrade your Champions etc. Just complete quest to earn extra gold, quest are also infinite so you never run out! Are you ready for that? Then go ahead right now and help your brave characters. Have much fun!